I’ve only been to New York a handful of times, but perhaps I’ll need to hang out in Insomniac’s Spider-man game to actually enjoy it. The in-game city is massive and sprawling, with people walking around on their way to work, cabs picking up passengers, and plenty of shops open for business. It’s highly detailed and full of life. The bummer is that I was only able to experience it from 50 feet in the air. Spider-man’s goal is to get us to feel what it’s like to be the hero, which often means having to miss out on some of the more mundane parts of digital cities. But that might be all okay, because Spidey leads a pretty fun life — and that web slinging across rooftops is so damn good that I’m more compelled to stay up there than I probably should be. 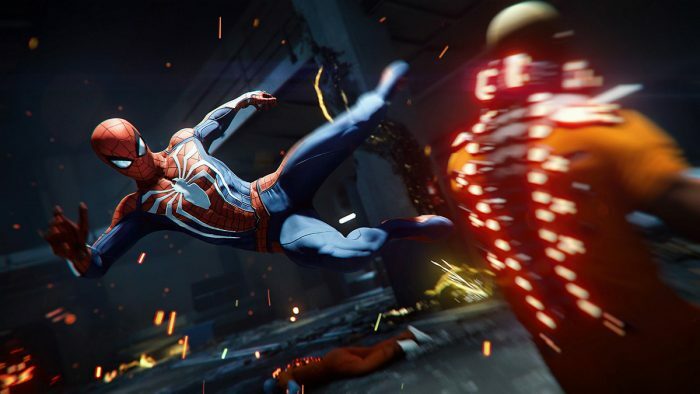 The E3 demo didn’t wow me in ways that would be considered surprises, but it did revel in the level of craftsmanship and dedication that Insomniac puts into all of their games: it’s tight, responsive, and feels like I can do anything in its giant open world. The demo takes place at some point later in the game, so we have plenty of abilities unlocked. We communicate with our partners via on-screen phone calls, and are tasked with breaking up gang activity at targets across the city. Those targets are represented by markers on the screen, and getting there is absolutely fun. Web slinging takes place across specific points on buildings, and the higher those points, the higher we go. Once of the issues with past Spider-man games (and comics and movies) is that the web line is always pointed up and we’re hanging from clouds. Not here, though. We can only really go as high up as the combo of the building height and how far our web slings us. The animation helps along with this, as the web lines bounce, slacken and get taut, letting us know if we’re going to get good enough speed and height. Spidey even flips and articulates his body based on how he’s holding to the web… it feels nice and reactive instead of just a pendulum on a string. Though we can go anywhere, the actual marked locations are smaller combat arenas. As I meet up with a group of suited thugs, a small CGI animation takes place as Spidey perches ready to attack. Then, it’s a fight. Being on the ground is a bit different than in the air, and you can really feel a sort of influence from Rocksteady’s Arkham Batman games. Battles take place with Spidey using a combination of melee and ranged attacks, and mixing in his Spidey sense to warn him of oncoming attack types. There are some brawling aspects, with punches, kicks and flips administered through canned animations, but as the suited bros attack me if starts to feel more choreographed than confined. In fact, it’s as if my attacks are autocorrecting for distance and force, which comes off a bit more natural than I expected. This smaller alley lets me jump and run off of walls and explore some of the more parkour aspects of the webcrawler’s skills. By contrast, the second fight I’m in takes place in a warehouse district, with a more wide open space that requires pulling towards and away from enemies with my webbing. That particular scene opens up with us perched from above (again, like Arkham) and jumping down to an unsuspecting enemy. The ranged attacks are far more important here, and building up a focus meter allows for some nifty slowdown and visuals and explosive moves. In both of these areas, we hear the great writing in the game, as Spider-man’s quirky commentary not only pokes a little fun at the situation but also gives us hints about where to attack. My final battle is in a bank against the Shocker. The pulse-emitting villain blasts open the vault and knocks me out into the atrium, forcing a fight that sometimes seems to go my way, but others feels like I’m in way over my head. At some point I realize that we’ve completely and utterly destroyed the bank building, probably causing more damage than whatever the value of items that Shocker was trying to steal, but it at least feels big and cinematic. 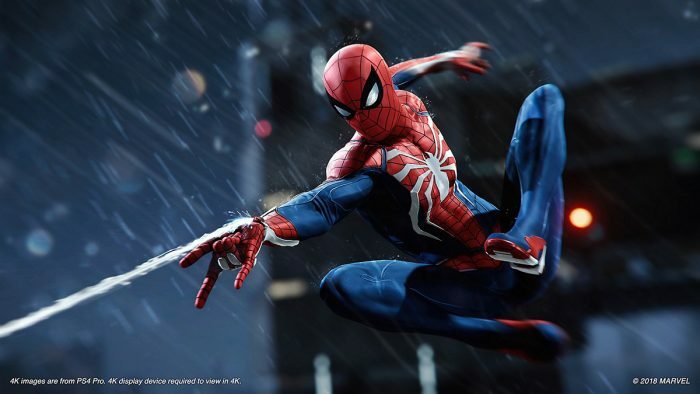 Throughout the demo, I’m focused on how this feels much more like a game based on Spider-man than a game based on a Spider-man movie or comic. We’re meant to feel like the person behind the mask, who doesn’t kill (instead just sticking enemies to walls or leaving them hanging off of buildings) and has a sense of right and wrong. It’s just one little section of a game that’s supposed to be ginormous, but it easily gets me excited to wear that mask and put on the costume. 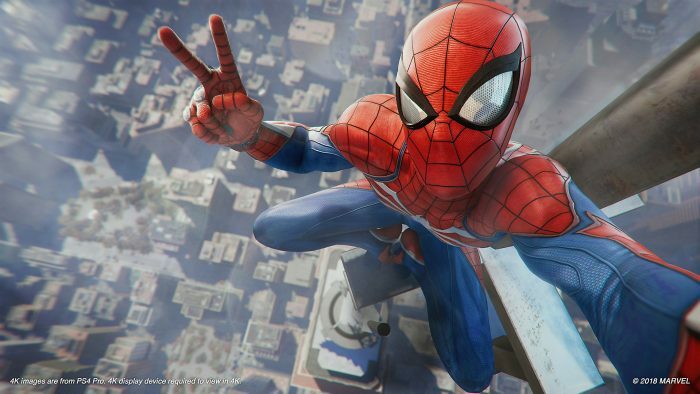 Spider-man arrives in September on PS4.